So this is an unusual find this weekend. One of Alexander’s roommates shared this with me. 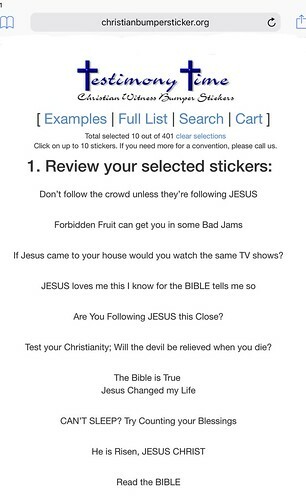 You can ask for 10 random “Christian” bumper stickers from the website below, or select 10 that you want for free. I definitely do NOT agree with all the messages included in their bumper sticker menu, but I DO agree with many of them. In most cases, these short messages encourage some worthwhile, critical thinking. Some reference Bible verses, most do not. I think a more random selection of these bumper stickers could be used as a catalyst for excellent conversations in a Sunday school class, about our beliefs and the ways in which we are called to advocate for and work for God‘s kingdom on earth.